Physical Security Online > Geezer Bandit > Where is the Geezer Bandit? In the United States about 5,000 banks are robbed every year. Obviously, the number of bank robberies fluctuates from year to year, but the total amount of loot stolen is rather staggering. For example, in 2010 $43,016,099.07 in loot was stolen during bank robberies – you read that right, over 43 MILLION! And in 2011, a mere $38,343,501.96 in loot was taken by bank robbers. According to FBI statistics only about 8 million (or 20%) was ever recovered. Despite high-tech surveillance cameras, silent alarms, dye packs and tracking devices hidden in stacks of cash, bandit barriers, and sometimes even armed guards, bank robbers seem undeterred. Maybe one reason is that almost half of all bank robbers end up getting away with it. Overall, in the United States the clearance rate for armed robbery is only about 24%. But when it comes to bank robberies, the nationwide clearance rate usually averages just a little more than 50%. This means that most bank robbers eventually get caught (usually because they keep robbing more and more banks! ), but overall almost half of them get away with it. History of the Geezer Bandit. 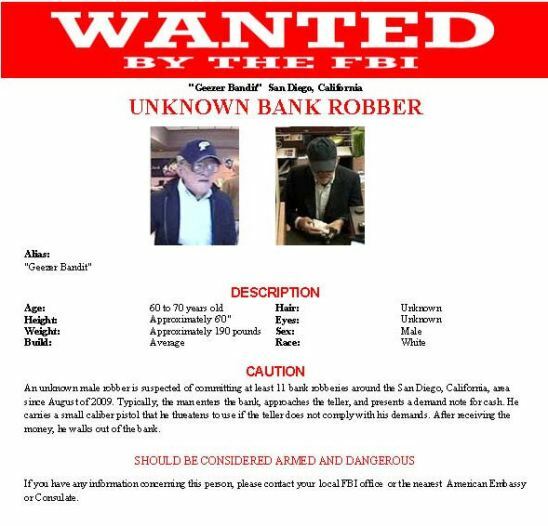 The Geezer Bandit is the nickname given to a man (at least the FBI thinks it is a man) who robbed multiple banks in Southern California starting in 2009. At least sixteen banks were successfully robbed by the Gezer Bandit. Aptly named, the robber appears to be an old man. He appears to be a white male and about seventy years old. The modus operandi of the Geezer Bandit follows the same general pattern. The Geezer Bandit walks into the bank like an unsuspecting customer. The Geezer Bandit waits his turn in line then hands the teller a note wherein he demands money at gunpoint. So far, this general plan has led the Geezer Bandit to untold riches, but only the FBI knows how much and they are not saying. The Geezer Bandit learns skills of the trade with each successful robbery. For example, as his robberies continued the Geezer Bandit started using a day planner to hide his gun. He also discovered that to make a quick escape with a load of cash, carrying a plastic bag was a smart move. Interestingly, out of sixteen confirmed Geezer Bandit robberies, only one security device was employed. The dye pack exploded catching the Geezer off guard. The Geezer Bandit escaped but his day planner was left at the scene. To this day, it is unknown to the public if forensic analysis was able to discover any touch DNA on the day planner, or if it resulted in any more clues. Efforts to Capture the Geezer Bandit. The Geezer Bandit is still on the lamb despite efforts by the FBI and America’s Most Wanted. The FBI looked into special effects masks used for theater performances and served a search warrant at a southern California company that makes masks similar to the one the Geezer wears, however, this has not led to the Geezer Bandit’s capture. The Geezer Bandit was also featured on America’s Most Wanted. The host, John Walsh, suggests the Geezer Bandit is really a young person in disguise. Walsh bases his theory on surveillance footage that showed the Geezer Bandit running at breakneck speed one would never expect an old geezer was capable of. The Geezer Bandit and his ability to elude authorities spurred copycat robberies. In 2010, a Geezer Bandit look alike attempted multiple robberies. He started with an attempt to rob a medical facility but walked away empty handed as the facility did not have cash. He then went a block away to a Bank of America but failed to get any cash. Persistence sometimes pays off. The Geezer Bandit look alike attempted to rob a third place and finally made off with some cash from another bank. Unfortunately, the Geezer Bandit look alike was not as skilled as the genuine Geezer. He used his own car to commit the robberies and police were able to use the license plate to track down the look alike’s home address and he was apprehended by local police. The rise of social media helps propel bank robbers from hand sketched faces on a WANTED poster in local sheriff’s offices to an online social media presence that gives criminals like the Geezer Bandit nationwide acclaim for his feats. Some people are trying to capitalize on the fan draw of the Geezer Bandit with t-shirts imprinted with a picture of the Geezer from surveillance images of his robberies. Someone even started a Geezer Bandit Facebook page, https://www.facebook.com/theGeezerBandit. In any case, a $20,000 reward hasn’t been enough to get someone to identify and turn in the Geezer Bandit. Is the Geezer Bandit Really a Geezer? Looks can be deceiving. As any good security professional knows, a good disguise can sometimes be virtually indistinguishable from a person’s natural appearance. A good makeup artist could fashion a disguise good enough to fool most. But would it be good enough to fool the FBI? So far it has. Silicone masks designed to transform people into senior citizens can be had for a small $800 investment. See an example of one of hundreds of online mask dealers. http://spfxmasks.com/store/index.php?route=product/product&product_id=49 While $800 may seem like a hefty startup cost, when the benefit is successfully robbing a bank where thousands of dollars are a stake, to some would be robbers this might seem like a smart business proposition. If anything, the Geezer Bandit’s elusive nature demonstrates his cunning and skill at understanding human behavior to escape capture. Why has the Geezer stopped robbing? Maybe the Geezer Bandit really is an old man who is living out his days in retirement bliss. He might tell his grandchildren stories of grandeur from his younger days, recounting multiple bank robberies and tapping the floor with his cane as he says his bounty helped pay for this very house. The grandchildren probably laugh it off and tell their parents that crazy old grandpa is at it again. Yet again, maybe the Geezer Bandit died. Maybe the Geezer is “out of circulation” because the Geezer is incarcerated in some jail on some unrelated charge. There is some speculation that mob boss Whitey Bulger, who was arrested in southern California after a long world-wide search, could be the Geezer Bandit. The FBI says they are looking into that possibility. Maybe because of all the publicity the Geezer is just “playing it smart” and “lying low.” Or, maybe the Geezer Bandit isn’t really a geezer at all but rather a spry young person. Given the Geezer’s small size and stature, the Geezer Bandit could even be a woman! The latest FBI theory is that the Geezer is still robbing banks, either without a mask or with some other mask that looks more like a normal aged person. The FBI is studying body movements of bank robbers in the hope that they can match up the Geezer’s body movements. There are a lot of unknowns in the Geezer Bandit robberies but one thing is certain: the Geezer Bandit is still out there somewhere. So the next time you go to the nursing home to visit Grandma, take a close look around. You might just see the Geezer Bandit!